It began with an idea. David Cage sits at his desk, but he can’t write. He looks for an image. He can’t remember the words he types into the search engine but, before he knows it, on his screen, a photograph of the actress Ellen Page. A funeral, a single idea and pictures of Ellen Page. “This,” says David Cage, “is how everything started with Beyond: Two Souls”. But David Cage is afraid. He’s afraid because he has spent the last 12 months looking at pictures of Ellen Page. In his studio a 2000 page script lies scattered with images of Ellen from the age of eight through to adulthood. What if the actress he’s about to meet bears no resemblance to the character he has spent the last year crafting? What if Ellen Page is not his Jodie Holmes? A funeral. The bleakest setting for inspiration. The permanency of death becomes brutally apparent when burying someone close to you. “It’s a very shocking experience, death,” says David. “Everyone knows that. David Cage had become used to inserting his own personal experiences into his writing, for him it was a revelation. Soon after the birth of his own son he asked himself a question: how far would he go to save his own child? Before long he was asking his audience the same question with Heavy Rain, a video game that surprised him by being both a critical and commercial success. He could never go back. On that day David Cage sat at a funeral and asked himself another question: is it possible to take this harrowing experience and make something positive? “I thought, ‘what can I write about this?’” he says. A picture of Ellen Page. Sixteen years old. Hair cropped short against her scalp. A tiny human, face etched in vulnerable, stubborn resilience. David Cage can’t remember the Google search that brought him here but, instantly, a spark. This was it. Ellen Page: his protagonist. His Jodie Holmes before Jodie Holmes existed. “I started writing the first scene of Beyond: Two Souls and I asked myself, ‘who is my main character?’ I thought she should have this strength inside her. She’s courageous and she’s brave. But at the same time she is just a little girl. Cage began writing and the words came easily. Then later, another scene. A new perspective was required. David Cage needed something different and began a fresh image search. Another set of keywords, another ‘click’. Another picture of Ellen Page. Fate? Possibly. But if you ask David Cage the creative process is simply a series of coincidences precisely like this. A small idea that grows, evolves into something entirely outwith your own conscious control. David’s idea for for Beyond: Two Souls was simple: he wanted to tell the story of a young girl at multiple different stages of her life, to catalogue that growth. That story grew into something far more significant. More pictures of Ellen Page. Ellen had been shooting movies since she was six years old: her entire life had essentially been documented. She never stopped filming. There were hundreds of photographs, a wealth of reference points at David’s disposal. Pictures of Ellen piled upon Cage’s script like a paperweight; with it came the added density of expectation, the weight of one single caveat: Ellen Page was becoming increasingly intertwined in this prodigiously huge video game project, but what if Ellen Page didn’t want tobe Jodie Holmes? What if Ellen Page wasn’t Jodie Holmes. Back to the bar, next to the Freeway in the part of Los Angeles David Cage has never visited before. David waits with the casting director he first approached when he began writing Beyond: Two Souls. They are waiting for Ellen Page. “Why Ellen,” she had asked initially, when David approached her. Why Ellen specifically? When David Cage explained about the pictures of Ellen Page in his script she became convinced it was possible. Ellen arrived. David expected an entourage — a lawyer, an agent, a manager — but she came to that first meeting alone. A surreal moment. David Cage had spent an entire year looking at pictures of Ellen Page. Now she was in front of him. Star struck? No. More like an eerie dissonance. David was essentially face to face with one of his characters brought to life. “The whole thing took like 10 seconds, but in my mind it was two hours,” says David, laughing. Prior to the meeting Ellen had received a package. Inside the package was a copy of Heavy Rain and some pictures, alongside a letter that did its very best to iterate precisely why she was the actress best able to portray the character of Jodie Holmes in Beyond: Two Souls. Neither David nor Ellen had any real idea what to expect from the meeting. The conversation lasted one hour. At no point was money or terms discussed. This surprised David. (“In Hollywood,” he says, “this is quite rare.") They talked solely about the script, about the character of Jodie Holmes, about the process of creating a video game of this scale. David Cage remembers being deliberately blunt: he wanted Ellen to commit to the project but, more than anything, he wanted her to commit fully. “I told her, ‘this is going to be very challenging’, This is going to be more work than films. 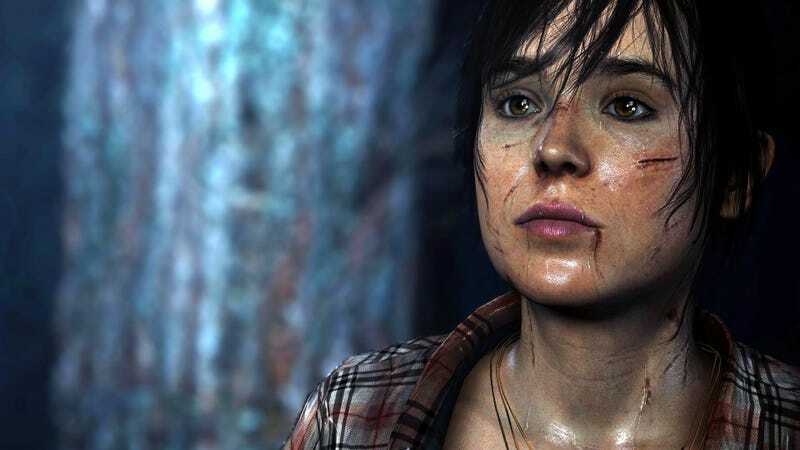 Before the day was out, Ellen Page had agreed to work with David Cage on Beyond: Two Souls. A 2000 page script lands on the desk of Ellen Page’s agent with a weighty ‘thunk’. You can imagine the fear. This was a project unlike any Ellen had ever worked on. She would have to learn these lines, there would be no prompter. She would have to memorise these words. And, since this was a David Cage game, there would be multiple different outcomes. Ellen had to be prepared for all of them. Let’s do it. David Cage and the team at Quantic Dream made a sincere attempt to prepare Ellen. They sent videos of previous mo-cap sessions, they sent documents, they sent pictures. For an actor used to performing on camera, the transition to video games can be quite traumatic, everyone understood that reality. Then Ellen arrived on set. At first she felt a little bewildered — that was to be expected. But slowly the realisation: acting on stage, no cameras to be aware of, no set design — this was acting at its core, at its most minimal and arguably its most powerful. A stripped back method of expression that relied solely on imagination. David recalls a story. Ellen’s co-star Willem Defoe arrived on set for the first time with the same bewildered expression Ellen once had. He was prepared, of course, but bewildered nonetheless. Ellen Page, by this point, had been shooting for weeks, already a seasoned pro at this mo-cap business. Their first scene together was a confrontation. A teenage Jodie Holmes wants to leave the house, but Willem won’t allow it. Immediately Ellen went on the offensive: she was screaming, she was in tears, she was angry. “She was really putting together an incredible performance,” Cage remembers. For Willem Defoe it was almost terrifying, the proverbial baptism of fire. A blistering welcome to the world of video game acting. Ellen Page didn’t want to see her picture. She didn’t want to see what she looked like in the game. During the shoot, she actively avoided it; terrified it might affect her performance. David Cage mentions she was especially worried it might not look ‘right’. Really Ellen had no idea what to expect. David remembers shooting one scene in particular. Jodie Holmes is on the run, there are dogs chasing her, a patrol of policeman. All of a sudden during the shoot, standing in an empty room, in a strange suit covered in weird technology, Ellen and David looked at one another and collapsed into laughter — suddenly aware of the absurd situation they both found themselves in. But on the last day of shooting, when David insisted on providing Ellen with an early look at her performance, it was this scene he wanted to show her: the one that made them laugh so much. “I said, ‘you need to see it!’ I had to force her a little bit,” laughs David. To David’s great relief, she loved it. “Ellen was surprised because, again, it was just her in this motion capture suit for weeks and weeks, just doing her best. Now it had all come together and it made sense. There were cameras and music. It becamesomething. It began with pictures of Ellen Page. Then it became something. Beyond: Two Souls is complete. The script David Cage wrote, pictures of Ellen Page dotted around his monitor, is now a fully formed video game experience. Soon we will interact with those performances, we will become a part of those performances. Beyond: Two Souls will become as much our story as it is David’s. Or Ellen’s. But David Cage will move on. To the next project. In a couple of weeks he will sit at his desk and he will begin writing again. Most likely that process has already begun. What images are dotted through the script he is currently working on? He won’t say.